About 75% of businesses globally have shifted to some kind of cloud service. Business analysts have predicted that the worldwide market for cloud services will reach a value of about $158.8 billion this year. Cloud phone system service providers offer phone systems for all business sizes. Many offer advanced unified communication features that businesses need to succeed, in the fast paced business environment of today. In the past, businesses had to rely on the use of physical and on-site equipment, (such as PBX cabinets) for phone systems and applications. Now, with the increasing shift to the cloud, these systems and applications can be stored safely in off-site data centers. 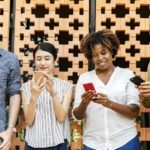 Below you’ll find 10 of the top reasons why savvy business owners are joining the shift to cloud phone systems, or reaping the benefits of already doing so. 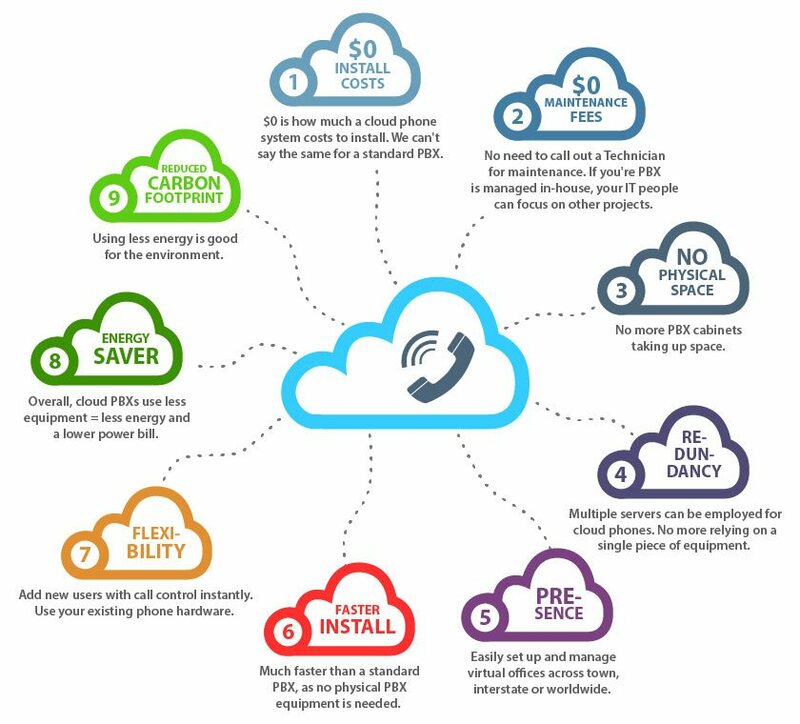 Also below, an infographic detailing 9 other main benefits of cloud phone service. There is high amount of cost saving to be had in a cloud phone system. Cloud based communications are cost effective for businesses, as they eliminate the need to pay up-front for heavy and expensive installations. Not to mention the regularly occurring maintenance charges of a traditional phone system. When you host your phone system on the Internet, you’ll be charged on a usage basis only. You pay only for hostage space and bandwidth that you require. Cloud phone systems also offer access to high-end features and upgrades for minimal to no cost. Commonly, set monthly fees per phone line or ‘seats’, are offered by cloud phone providers. 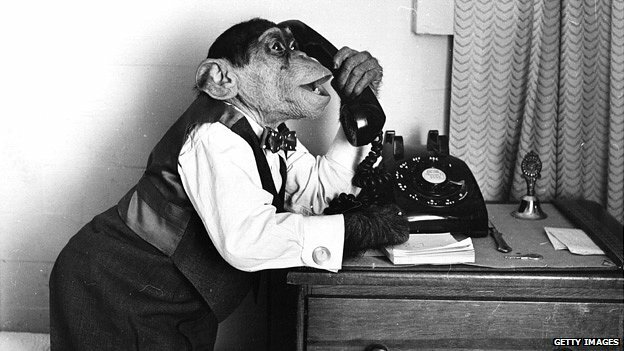 Business phone systems have evolved. Has yours? Image via Getty Images. Cloud based phone systems provide users with a variety of features such as voicemail options, advanced email and automatic attendants and many more unified communications options. Some other features include traffic shaping, which is useful in preserving bandwidth and helps in ensuring call quality and reliability. Some providers such as Fastmetrics, offer cloud voice over privately managed networks, so your phones never travel on the public Internet. Cloud phones can also connect with two different on-site Internet circuits, which is useful in providing backup. Cloud phone systems benefit businesses with access to the latest voice features without any hardware updates. 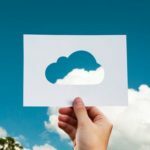 Whether your business is growing or downsizing, a cloud service will provide the flexibility the business needs today and also for future growth. It is the aim of any business to scale. So should their phone system. For anyone who has had to expand or move an on-premise phone system, they will surely know the degree of difficulty involved. Lots of equipment, lots of man-power and lots of careful moving, of large hardware. A phone system in the cloud is easily and quickly organized. The only shifting required is of handsets or cables, without any extra burden on your business IT department. (Click on the image to see the full version). What business doesn’t need continuous communication today? A cloud phone system benefits and empowers businesses with off-site work forces and remote employees. Cloud hosted systems provides the ability to communicate with all co-workers and customers, no matter their location. 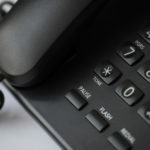 Your business phone system should never go down. Ever. It needs to be up 24/7 to support your customers and to receive inbound sales, leads or new business. A cloud phone system protects against loss of business voice in case of disasters. Utilizing the cloud ensures a reliable and resilient phone service, always. With cloud phone systems, companies with varying locations can deploy a more unified phone system with remote offices setup efficiently. All users experience the same call quality, plus the same features. Your business IT department will have many things to focus on, without adding phone system maintenance to their work load. Cloud phone system benefits are possible as a vendor manages your system off-site. Your IT department will be free to focus on issues that have higher priority. 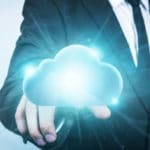 One of the great advantages of the cloud, especially a private cloud solution, is that there is no fear of sacrificing data security when you allow company data to exist, outside the local firewall. Security is increased when a client uses a cloud phone service for business due to stringent ISO security standards that cloud providers should always adhere to. Time to value with cloud phone services is quite less than on-site phone services and applications. Not only is implementation time decreased, but the IT resources required to roll out the cloud solution are also significantly less. For example, if you’re a Silicon Valley startup and you need to get on the phone to cold call prospects or potential investors, a cloud based phone system provides a faster avenue to do this. As you grow and hire another sales team member, their phone system can be setup instantly. There is no need for an IT person. Just a simple call to your cloud business phone system vendor, to have the same phone functionality and features to grow your business. Fastmetrics offers all of the above benefits over our privately managed voice network, for optimum call quality, as well as unlimited free local calls within the USA. See some of our cloud phone customers and read our cloud based phone system reviews. 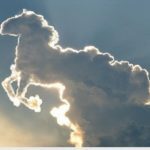 What Is Cloud Computing & How Does It Work?